Suit is gorgeous but runs BIG! Order it a size smaller. Also, it comes with a scratchy yellow shirt instead of the nice white shirt pictured. I returned the size 12 and ordered a 10. I hope the new size comes with the white shirt and NOT the yellow shirt!!!!!! I love the color of this suit. The materials seems strong enough not to worn out quickly. 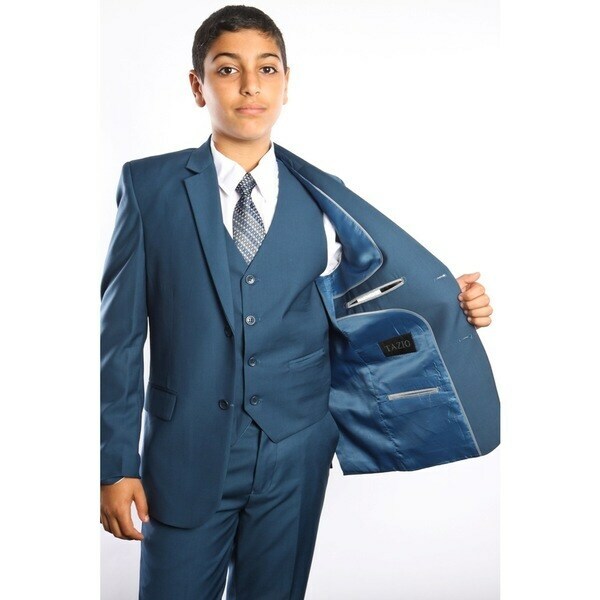 Its so hard for me to find suits for my 12 year old but I hope this will fit him. Yes I recommend this. Very nice suit. Pants were a little longer than I thought but no biggie, just hemmed them a bit. Great fit. Well crafted. Nice variety of colors to choose from. My son looked great in this suit, I will definitely order again in the future for my suit needs. "What is the fabric on that suit?"